I’ve got festive kid-made Chocolate Covered Marshmallow Pops for you today. A project that is fun to make and give to friends and neighbors. Like I said in my Chocolate Peanut Butter Spider Cookies post last week, I loooooooove to make Halloween treats. However, due to the fact that we produce so many of them for our Halloween party and to pass out to friends, I don’t like making complicated Halloween treats. They’ve got to be simple. 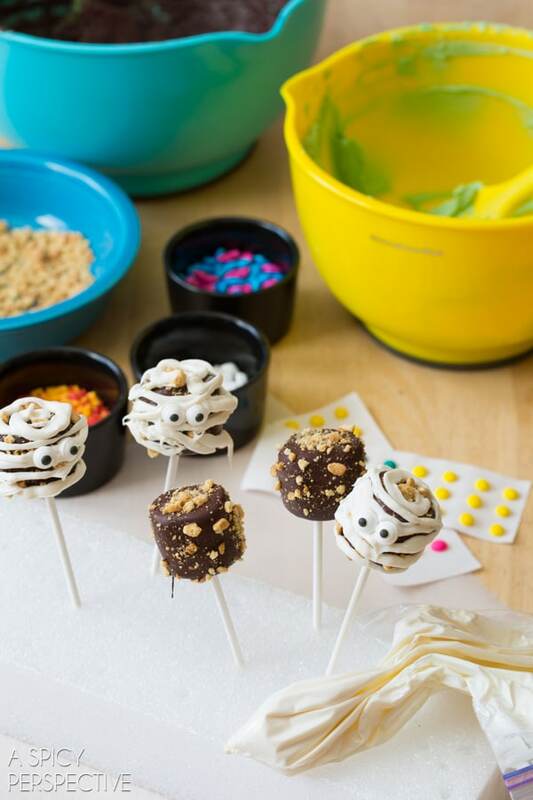 Well, today’s Chocolate Covered Marshmallow Pops are as simple as they come. There is no baking involved. In fact, this could be a completely hands-off project for the grownups, Yet an exciting weekend project for the kids! Poke a popsicle stick down into a marshmallow. 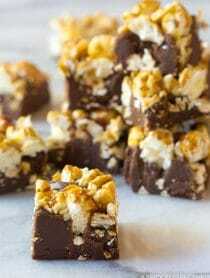 Melt chocolate or candy melts in the microwave. If you don’t like the microwave melting method, you could always place the chocolate on low over a double-boiler to melt. We made several varieties on this particular day. S’mores Chocolate Covered Marshmallow Pops required very little decorating. 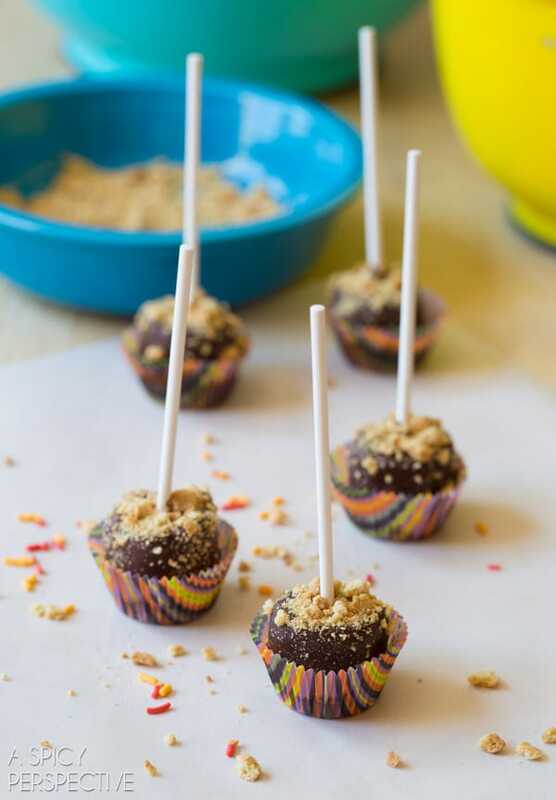 You simple sprinkle the chocolate dipped marshmallows in crushed graham crackers. 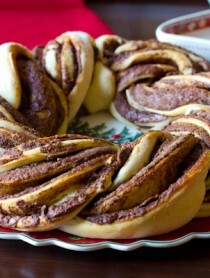 You could also do this with toasted coconut or pistachios! We also made Pumpkin Patch Chocolate Covered Marshmallow Pops. We made Mummy Chocolate Covered Marshmallow Pops by piping melted white chocolate around the dark chocolate and adding candy eyes. 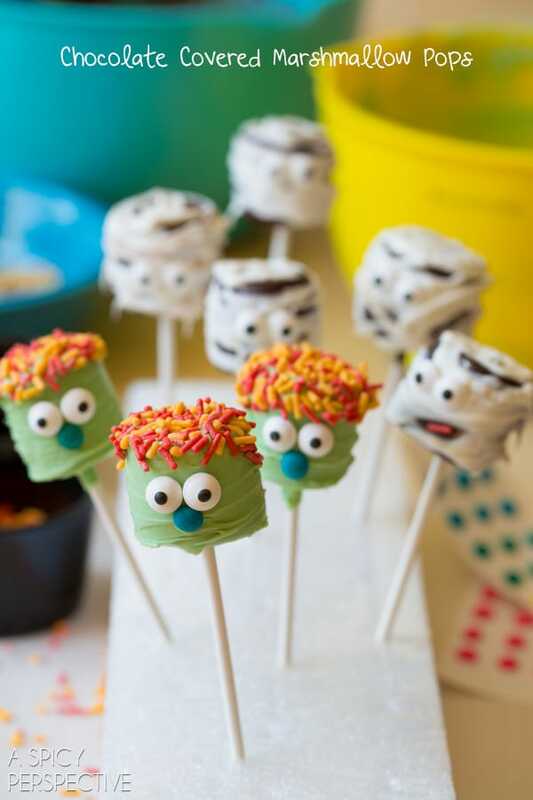 And Monster Chocolate Covered Marshmallow Pops by dipping the top of the pop in orange sprinkles for hair, then adding eyes and a candy nose. Having a piece of styrofoam is handy to have, to poke the popsicle sticks in while they dry. 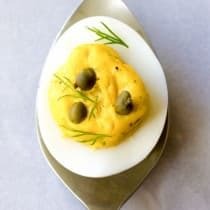 However you could use an egg carton, or set them down in paper liners. 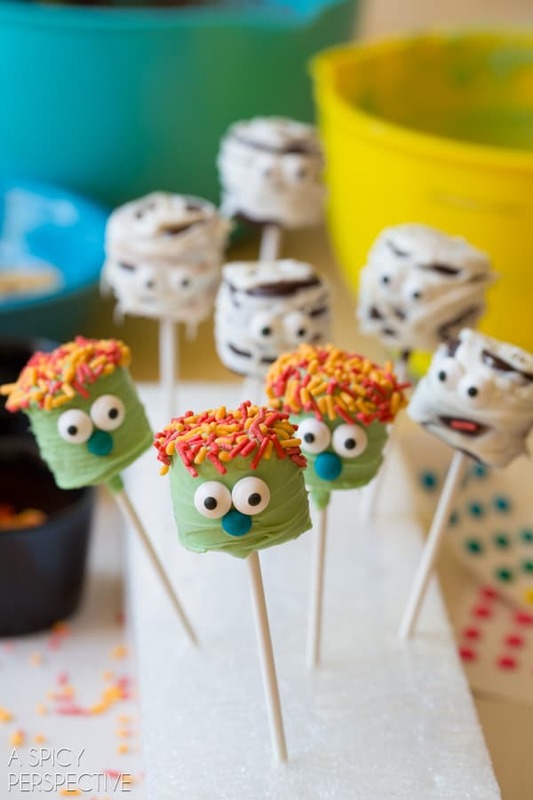 However you decide to decorate your Chocolate Covered Marshmallow Pops, they will offer tons of spooky fun and family memories this year. Press a popsicle stick in the middle of each marshmallow, until it goes all the way to the other side, so it is secure at the top of the stick. 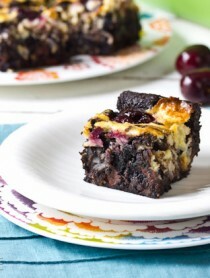 Place the chopped chocolate in a microwave safe bowl (reserving a handful) and microwave on medium in 30 second increments, stirring in between, until melted. Throw in the remaining chopped chocolate and stir until completely smooth. Adding the extra chocolate at the end sort-of tempers the chocolate without any effort, so it doesn’t dry cloudy. 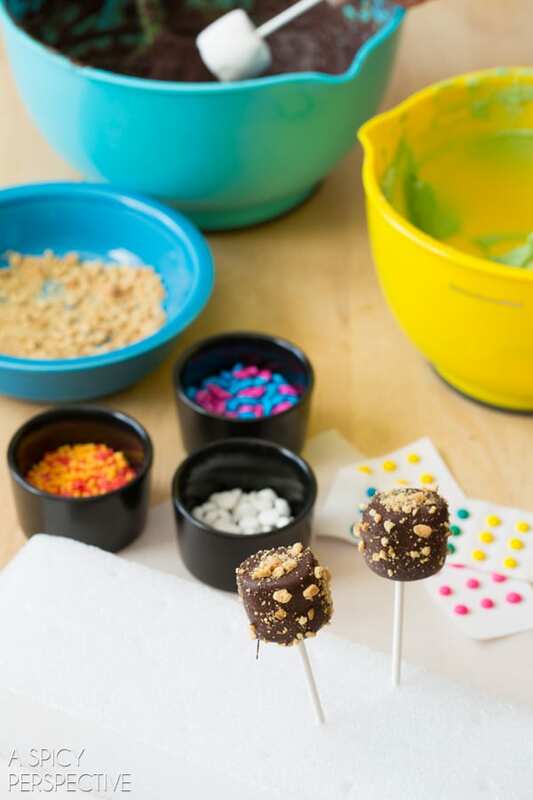 While the chocolate is still loose decorate the Chocolate Covered Marshmallow Pops: Sprinkle with crushed graham crackers for S’mores Pops. 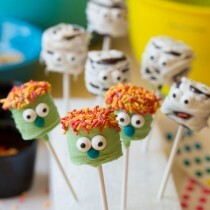 Decorate with sprinkles, candy eyes, and nose for Monster Pops. Pipe with melted white chocolate and add eyes for Mummy Pops. 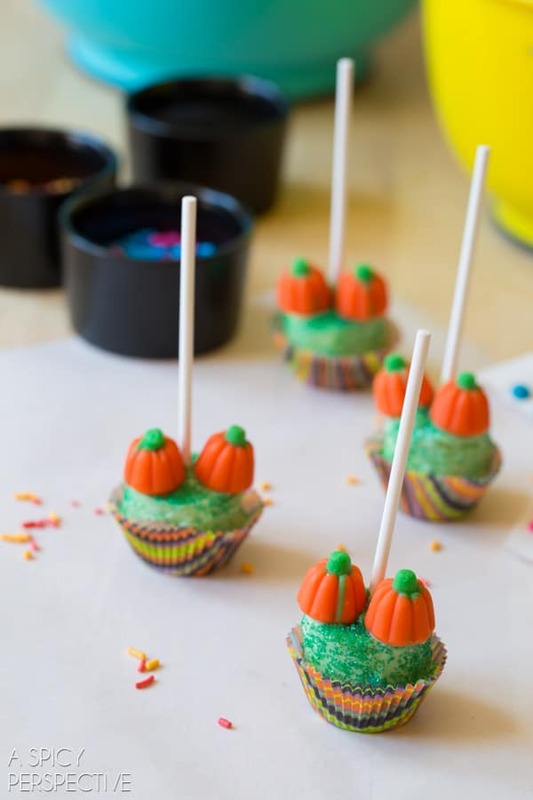 Or add candy pumpkins and sprinkle with green sprinkles for Pumpkin Patch Pops. 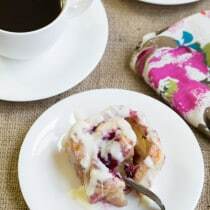 Place in mini muffin papers or in a piece of styrofoam to dry. Once dry, store in an air-tight container for up to 2 weeks. These are so very cute! Just pinned! These are absolutely adorable!! 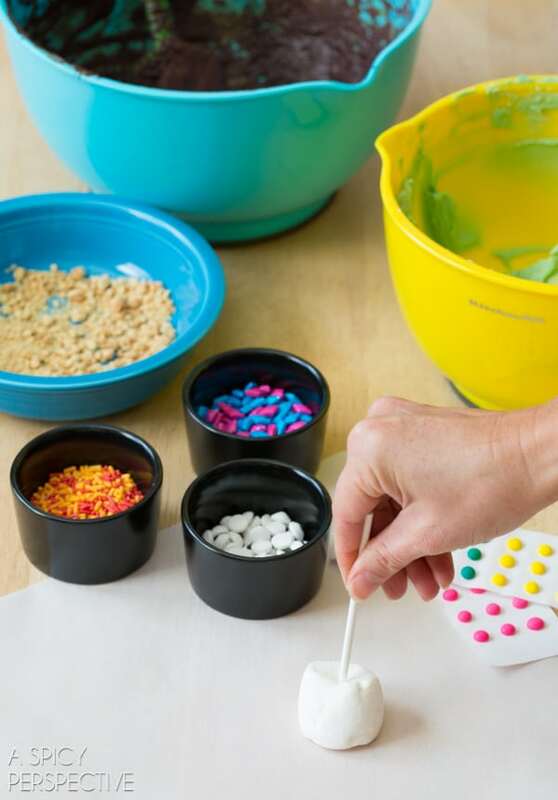 The perfect craft to do with kids! Too much FUN!! Adorable. And who doesn’t love a marshmallow?! 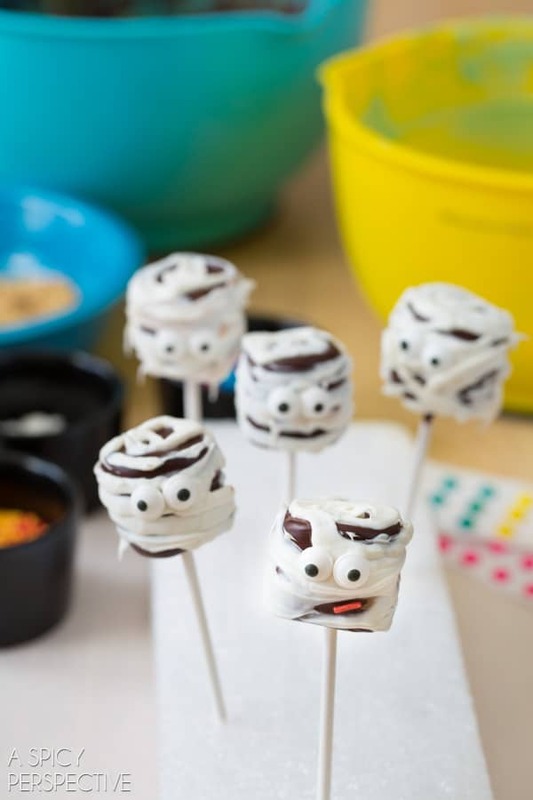 Adorable…I think the mummies are my favorite! Love em! 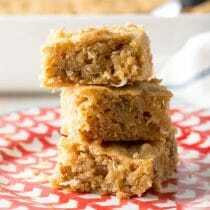 I am so making these for my favorite kiddos. Pinned! They are SO cute!!!! My kids would flip for these! These are SO fun, Sommer. Love the creative ways you made these pops! These pops are so creative & adorable! So fun! I need to make these with Caleb! These are so cute! Perfect for Halloween Class parties! 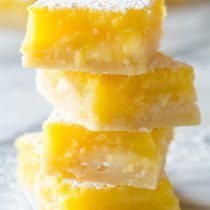 Those look freaking amazing! Love the mummy ones!